Without we are nothing. With it we are slaves. Beware the tower, it is a staircase that spirals down no matter what direction you walk it. Some of the first generation of Orphans still live to this day and they speak with such emotion about the greatest fear they've ever felt in their lives. The moment of awakening. To go from non-existence to suddenly being thrust into the bitterness of living world. They found themselves on the streets, in buildings, in the fields outside the city or bobbing in the waters of the river. They could barely comprehend what had just happened and horror of reality shattered many of their minds the instant they opened their eyes. The first generation just ... woke up. They had nothing but simple white gowns, a dangling name tag with a name they don't remember and a head full of skills without the memory of learning them. They simply... were. They rallied around a man named Loken Gainer who's charisma was enough to unite them in those early days. When the city was finally working toward a purpose and a direction Loken Gainer vanished as quickly as he arrived. He departed saying he would return but that day never came. The humble, unsettling beginning of Ironrise is the stuff of legend now. Only a handful of citizens from those early days are alive and most of them are senile now. The Ironrise of today is the cornerstone of an empire that stretches from the Gainer River to the Reach Mountains. It is the master of the known world, the chain that binds every citizen together and the will that drives them to expand. The city itself extends out for miles in every direction, each district like a world unto itself. The seedy, ravenous and tantalizing streets of Silken Row stand in stark contrast to the imposing edifices of Ram's Rule and those too are worlds apart from the forest-like garden district of Black Forest. Every district, every citizen and every city abroad all kneel to the authority of Pinnacle Tower, the blade-like monument from which the Prime Minister looks down upon his world. The current ruler is Prime Minister Beckett Blackwell. Like all the past Prime Ministers he is elected by popular vote. Though ... no citizen can ever recall the exact details of the last election but, they're certain they voted for Blackwell or didn't vote at all. It's a thought that they rarely dwell on and find strangely unnerving if they try. The city is a place of industry, opportunity and jaded realism. Those that live here are exceptionally proud to come from the place that all foreigners must kneel to. They're largely ignorant of the crushing oppression of the Ram's Wrath constabulary forces and the unbreakable grip of organized crime that chokes the city dry. Life is cheap in Ironrise. The average citizen struggles to earn enough scrip to get by while avoiding dangers like the dangers of the streets, the abuses of authority by the Ram's Wrath and the horrors that crawl up from the sewers by night to plague the lonely places of the city. The middle class of Crow Coil and the elites of Raven's Perch are largely unaware of the challenges the poor and forgotten face. Yet, even they can find themselves slaves to the system. Ironrise is in desperate need of heroes who are willing to stand in defiance of Pinnacle and fight for the common man, the unions and to free the city from the grip of the indisious Prime Minister. The vast majority of the citizens live in some state of poverty or another. Perhaps only 40% of the city could truly be considered the middle class or above. Pinnacle Tower is the center of government for every known city on Spirel and it is also the municipal office from which Ironrise is governed. The mysterious Prime Minister rarely leaves his tower and few are admitted to an audience with him. Ironrise has a massive standing army, police force and air force. It also has the Prime Ministers gigantic battleship, the Obligation looming overhead when it is not traversing the vassal cities as a show of force. Port Shatter and Iron Reach are almost entirely dependent on Ironrise's exports to survive. Should Clocktower ever rebuild it will be chained to Ironrise as well. 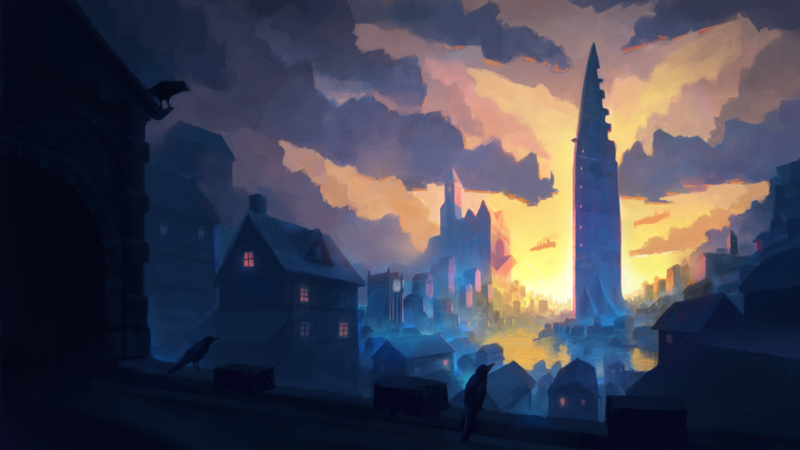 The exports from these other cities are often seen as novelties and luxuries by the citizens of Ironrise and they fetch a high price in scrip. Iron Twist is responsible for almost as much machinery, factory output and raw material processing as the whole of Clocktower It has multiple airship docks and the facilities of Bell Harbor are open to take in river-going vessels as well. They also produce almost all of the Construct labor found anywhere in Spirel from within their secretive Iron Twist facility, The Construct Quarry. Situated along the Gainer River just north of the Scorchlands. The area around Ironrise is mostly open plains and hills.